I started Sunday by mixing 1/2 cup white whole wheat flour (instead of my usual unbleached white flour) with 1/2 cup water. I covered it with a cloth and stirred it occasionally. 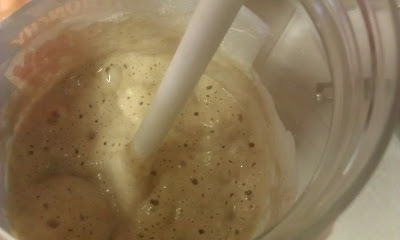 The next day I added another 1/2 cup flour and 1/2 cup water, and stirred occasionally. And the next day I did the same thing. Today I poured out 1 cup of the mixture and added 3/4 cup water and 3/4 cup white whole wheat flour - and stirred occasionally. It's happy stuff, and it smells good, though not really 'sour' yet, so I'm going to keep working on it. Also, I'm making sauerkraut for the first time ever. It looks pretty. I hope it turns out good, but I'll have to wait a week or two to find out. 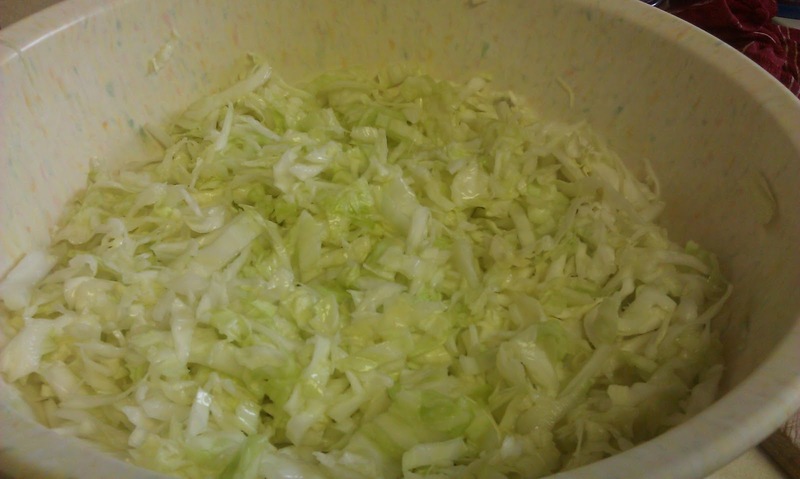 Toss cabbage & salt together in a large mixing bowl, “massaging” as you toss … squeezing the cabbage and salt together, kneading it thoroughly. This will help break up the cellular structure of the cabbage. Let sit for several minutes so the cabbage becomes limp and begins to release juice. 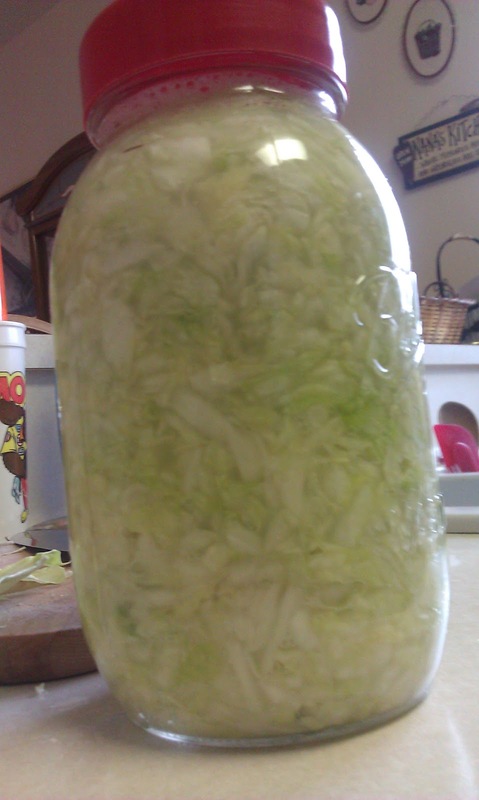 Pack the cabbage a little at a time into jar, crock or fermenter as tightly as you can, pushing down on the cabbage and eliminating air bubbles. The liquid should rise above the cabbage. Continue packing the cabbage until it is completely submerged by the liquid brine. Screw on the lid tightly and allow it to sit at room temperature, undisturbed, for at least seven days. It will bubble and pop and you may want to check on it to release some of the air, ensuring you keep the cabbage submerged when you replace the lid. Now, I just need patience.